Click image for a lager view. At the end of March, spring took its turn at the Utah Department of Environmental Quality (DEQ). Along with the warmer weather, budding trees and blooming flowers, DEQ’s Division of Air Quality declared an end to the 2017-18 inversion season and stopped issuing its Action Forecasts for PM2.5 pollution. Rest assured, the Action Forecasts will return in Nov., along with colder weather. Taking a look back on the last four months, Utah’s air quality was a mix of good and bad. First the bad. By mid-December, a high pressure system settled in over Northern Utah. This locked cold air on the valley floors and produced the dreaded thermal inversion. Normally, air temperatures decrease at a rate of 3.5°F for every 1,000 feet up into the atmosphere. Under these conditions, the air mixes and spreads around pollutants. During an inversion, temperatures rise with increasing altitude. The warm inversion layer then acts as a cap and stops atmospheric mixing. The corresponding stable air column keeps pollutants down near the ground. Residents of the valleys are then exposed to more and more pollutants as the inversion continues and emissions remained stuck near the ground. During December’s inversion, the Salt Lake Valley had four days of Voluntary Action and 18 days of Mandatory Action. 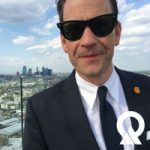 During this time, there were also three days were the region exceeded the Environmental Protection Agency’s (EPA) standard for PM2.5 pollution. January was a little easier on the lungs, with only nine Voluntary Action days and nine Mandatory Action days. By late January, temperatures were unseasonably warm. This trend carried all the way through February. The lack of snow and mild temperatures kept any substantial inversion from building up. Once the monsoonal flow started in late February and early March, regular rain and snow storms mixed out any pollution that started to build up. During December 2017, the valleys of Northern Utah experienced a prolonged inversion event. Is Utah’s air getting better? 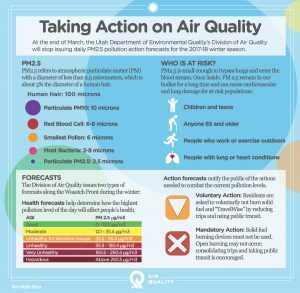 Utah’s air quality is getting better. There has been, however, an influx of transplants moving to the Beehive State. This is a trend that will continue for the next 30 years, according to most experts. Along with this migration comes more cars and more emissions. So, even though Utah has seen significant reductions in per-capita emissions, the growing population will continue to stress our airshed.